I was running so fast I felt like I was going to crumble. My legs were practically jello when I finally stoppped. I knew you should never stop especially when your on the hit list. And I was most definitely lost with enemies, hiding in the shadows. "You should know you can&apos;t run from a vampire." The green eyed one said. I couldn&apos;t speak, I was breathless. "Give up already it&apos;s two against-" I heard a sickening crack. "One." Jace whispered in my ear. I chuckled at his grim humor. "So what are you going to do now? Your partner&apos;s dead, your up against a full vampire and a vampire hunter." "Not unless the vampire threats its prey." He hissed. Those eyes of his disappeared into the shadows. Jace whirled around, catching a dagger just mere inches from peircing my neck. "Damn that was close." He muttered, breathing a sigh of relief. He threw the dagger back into the brush and I heard a mumbled curse. "I think he&apos;s gone." I whispered. Then I was forcefully wrenched over a shoulder and the woods became a blur. "No I&apos;m not." I struggled trying to break his hold. "Knock it off, I&apos;m not stopping until I get back to the club." "That&apos;s where we live, your going to be stuck with us for awhile, until the council decides what to do with you." I was about to scream Jace&apos;s name but he flipped me so he was carrying my bridal style and covered my mouth. "Hell no!" I muttered against his hand. I clawed at his arm but it slowly healed back up. "Nice try sky." I moved so my hand was uncovered. "Don&apos;t call me that!&apos; I hissed, reaching for my hidden dagger. "Looking for this?" He asked, waving it in my face. I knew if I reached out for it he&apos;d simply chuck it some other place. "Come on don&apos;t you want it?" He teased. "Good I might have stabbed you with it if it had been a different answer, but something as pretty as you shouldn&apos;t be wasted." He stopped and a city appeared before my eyes. Neon lights glowed in a ridiculous amount of colors. Skyscrapers were so high I couldn&apos;t see the sky. It was dark and cloudy, cold for my tastes. I could hear pounding music coming from beneath our feet. He stroked my cheek, surprisingly. I could see longing in his eyes. "Someone close to you died, didn&apos;t they?" His eyes flashed with anger and he dropped me on the ground. "OW! What was that....for?" He was gone without a trace. What the hell he goes through all that to get me and now gives me the chance to run away? "Ah hell! Did he seriously drop off another one?" I turned around seeing a guy standing in the rooftop doorway. I studied him carefully, uncertain whether he was human or not. A redhead with dark blue eyes, a strong face and perfectly arched eyebrows, someone that would most certainly be a likely candidate for a vampire. "In case your wondering your at The Devil club." "Devil club?" He shrugged and sighed. "Come on I&apos;ll show you around." "What!?! I can&apos;t be here, this is where-" He cut me off. "The vampires are, yadda yadda yadda, chill girl isn&apos;t this why you&apos;re here?" "No I was kidnapped. I need to get back to Jace." "Jace? You mean the vamp prince?" "Hell I don&apos;t know how you got mixed with the royals but should probably get back there." "No I know but why would Adrian bring you here?" Adrian so that was his name. "He said I was gonna stay with them for awhile." "Skyler Vandeguard." He took a defensive stance. "Look I&apos;m not going to kill you, I&apos;ve never even killed a vampire, let alone a halfie." "So you&apos;re the special daughter?" I nodded as a reply. "Then if I touch you it&apos;ll burn?" "Are you a full vampire?" I asked. He shook his head. "No it won&apos;t hurt why-" I was shocked as he kneeled down before me, taking my hand and placing a kiss on it. I blushed, quite confused of his actions. "My name is Isaac, leader of the resistance." "Wait if your leader of the resistance than why is Adrian staying here?" "This place is under control of vampire territory you think I have a choice." "Um...you got a point there." I mumbled. "So you mean the organization for half-vampires?" "But I thought....do you know Rayas?" He gave me a blank stare, thinking. "Rayas...Rayas...where have I heard that name before...."
"Now I know he got into the royal council as peace marker between vampire and half-vampire, saying he turned his back on human kind." "Well that&apos;s a lie, he needs me to continue on the vampire hunter legacy that runs through his veins. Do you know of the prophecy?" "Apparently I&apos;m a part of it." "That makes perfect sense, you fit the vampire&apos;s destruction perfectly." He said, teasingly. I slugged him in the arm. "Focus I need to get back to Jace." "No can do princess, if Adrian dropped you off here I can&apos;t help you, your under council watch." "But isn&apos;t he in the vampire resistance?" He laughed in my face. "You got...to be joking....no way he works for the council too. I direct donor to vampire business here. I believe since Adrian put you here, you&apos;re going to have to earn your keep and become a blood donor." "I can&apos;t give my blood for free! Are you insane!?!?" "A little bit." He shrugged. I smacked my forehead. "My blood allows vampires to touch me there is no way in hell I&apos;m going that." "Then you&apos;ll have to earn your keep a different way." I watched his movements carefully, his hand snatched out to knock me off balance but I blocked it. 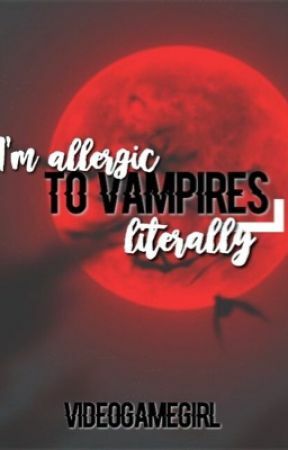 "If you haven&apos;t killed a vampire how are you still alive?" He questioned, trying to get a hit on me. "I learn their weaknesses. I spot them before they can strike." I said. I quickly dodged his simple attacks, and then I realized this was too easy, was he trying to bore me? I knew he was faster than this. "Stay still." He hissed. "Come on if you want you can be just my blood donor." "Why would I want that? How does that make it better?" "I won&apos;t force you to bond with me." "Why me?" I felt a finger on the pressure point of my neck. Damn. "You play a bigger part than you could ever imagine." He whispered in my ear. "I can give you protection the royals can&apos;t. I can make you blend in with the crowd if you let me." He pressed harder on the joint and body collapsed. Thankfully he caught me before I hit the ground. "Sorry but this is for your own good." I blacked out.